Fleas are tiny bloodsucking insects that attack dogs, cats ans many other domestic and wild mammals and birds, including horses, cattle, sheep, goats, pigs and other livestock. Fleas can be found everywhere in the world, regardless of climatic conditions. In regions with cold winters the flea populations show a seasonal pattern with peaks during the summer. Ctenocephalides felis, the cat flea; occurs worldwide and attacks pets, livestock and humans as well. Ctenocephalides canis, the dog flea; occurs worldwide and attacks pets and livestock and humans as well. Pulex irritans, the human flea; occurs worldwide and attacks pets and livestock and humans as well. Echidnophaga gallinacea, a cosmopolitan sticktight flea that may become a serious problem in poultry operations. Tunga penetrans, the chigoe flea, jigger. Can proliferate in poultry and other livestock operations in some countries with mild weather conditions. Most of these flea species can develop massively in poultry houses but also in cattle, sheep, goat, pig and horse stables, especially on dry bedding such as straw, sawdust or sand. Since all these flea species can bite humans as well, this becomes often the major nuisance in livestock operations: workers may rightly refuse to work under such conditions. Adult cat, dog and human fleas are rather small (1 to 3 mm) and move freely between bird feathers or in the haircoat of mammals. 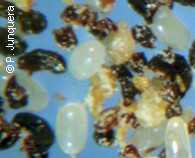 Both males and females are obligate blood sucking parasites, i.e., their only food is blood. They have biting mouthparts that pierce the skin of their hosts. Adult females lay eggs that fall to the ground. Larvae hatch out of the eggs and remain in the bedding eating mostly the excrements of the adult fleas that also fall to the ground and consist mainly in incompletely coagulated blood. They also eat other vegetable debris and their own old skins (exuviae) left after moulting. Echidnophaga gallinacea, a sticktight flea has a particular behavior. Gravid females bury themselves into the host's skin where they start to lay eggs that cause swellings and ulcers. It can infest all kinds of mammals and birds. In poultry adult fleas may congregate in large numbers forming clusters around the eyes, the comb or in other naked parts of the skin. The eggs fall to the ground and develop as most other flea species. Tunga penetrans also buries itself into the host's skin, in mammals especially in the feet, where they can produce ulcers quite difficult to heal. The life cycle of most flea species can be completed in about 30 days, depending on weather conditions. However, in stables or other animal facilities that have not been used for a certain time (e.g. during summer, when animals are grazing outdoors) there may be sudden outbreaks of fleas when animals come back. This can be explained by the fact that mature flea pupae can remain in the bedding without hatching for up to 6 months as so-called pre-emerging adults. Once the animals come back, such fleas detect their body heat, movements, pressure caused by footsteps, and increased carbon dioxide (CO2) that stimulate their hatching, which can take place more or less simultaneously. Flea bites and subsequent itching are certainly irritating for livestock and horses that reacts with intense scratching and stress. In severe cases scratching can cause wounds that become infected. Weight loss and reduced milk or egg laying performance may result. Fleas can also transmit some diseases, e.g. classical swine fever. Nevertheless, it is not usual that fleas become a mayor economic problem in modern livestock or horse operations. As already mentioned, the major nuisance in livestock or horse operations is often that workers rightly refuse work under such conditions. Most insecticides (e.g. organophosphates, pyrethroids) effective against adult flies or lice on livestock and horses will control adult fleas as well (e.g. as sprays, pour-ons, etc.). However, within a flea population only about 5% of the individuals are adults that are on the animals. The remaining 95% are immature stages off the animals, mostly in the bedding, around the birds nests, etc. This means that treating the animals is usually insufficient to control the flea population. Directly treating the bedding and other possible resting places must be considered as well. This can be done with larvicides, e.g. with some organophosphates, carbamates, pyrethroids or insect development inhibitors (e.g. cyromazine, diflubenzuron). An alternative can be to regularly eliminate the old bedding potentially contaminated with immature stages and to replace it with uncontaminated fresh one. It is useful to know that dry bedding is better suited for flea development than wet one. But wet bedding favors development of various fly species (e.g. houseflies, stable flies, etc.) that also develop off the animals. Bedding replacement can be scheduled based on the duration of the life-cycles of fleas or flies, according to what represents the major threat. Products based on macrocyclic lactones (e.g. ivermectin) used at the therapeitic dose will not control fleas, neither as injectables, nor as pour-ons, drenches, or feed additives. A lot of domestic or wild animals can introduce fleas in animal facilities: dogs, cats, rodents, birds, etc. If fleas are a problem in a given property, restricting their access to the animal facilities may help to keep the fleas under control. There are no true vaccines that will protect livestock, horses or pets from stable flies. There are no effective biological control methods against fleas on livestock or horses. Learn more about biological control of flies and other insects. Click here if you are interested in medicinal plants for controlling fleas and other external parasites of livestock, horses and pets. If available, follow more specific national or regional recommendations or regulations for flea control on livestock. Little is known about flea resistance to insecticides in livestock or horse operations. However, resistance of cat and dog fleas to veteran insecticide chemical classes (e.g. organophosphates, carbamates, pyrethroids) has been intensively investigated in human households and is very common worldwide. Since most flea infestations of livestock or horses are due to the same species that infest pets and there are no real barriers between fleas on pets and fleas on livestock, it has to be assumed that some cat and dog flea populations on livestock or horses are already resistant to several insecticides as well. A practical consequence of this is that if a particular product of the mentioned chemical classes does not achieve the expected control, it is reasonable to consider a resistance problem, especially if that product has been used for several consecutive years. However, experience shows, that many cases of product failure are due to incorrect use and not to resistance.